Joel McCrea and Randolph Scott in Ride the High Country. 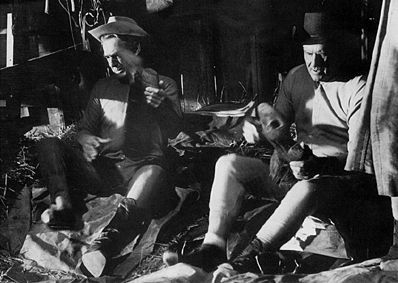 Ride the High Country combines the swan song of actors Joel McCrea and Randolph Scoot with director Sam Peckinpah's transition from TV to film Westerns. Though the film's production values have more in common with '50s television than Peckinpah's later films, McCrea and Scott's performances provide a solid capstone to their careers while Peckinpah demonstrates his ability to coax irony and pathos from a rather predictable "end-of-an-era" Western plot. Ex-marshall Steve Judd (Joel McCrea) arrives in town for a last job--to almost be run over by a motorcar with a policeman scolding: "Watch out, old timer." Despite this sign, Steve believes that the world still has use for a frontier lawman, that he can still be a figure to be reckoned with in the West. After a slow decline in status from marshall to brothel bouncer, he has been offered a position guarding gold deposits of $250,000 from the wild mountain claims to the bank in this orderly town. Of course, the glory of the job is not what was promised: the deposits are only running around $20,000 and the prissy bankers look askance at his age and his threadbare shirt cuffs. The performance by McCrea is perfectly balanced between the melancholy over his low fortune and the power of his unreduced ability. Steve meets his old friend Gil Westrum (Randolph Scott) at a carnival booth, peddling (and padding) his past exploits as "The Omaha Kid." (Outside of minor roles in Cecil B. DeMille silent films, this film marks the first appearance of these actors together.) Both men are looking for their ultimate reward for their lives of service. Gil is looking for a large financial payoff; Steve sums up his desire: "All I want is to enter my house justified." As in other Westerns featuring older heroes, the disparate values of these two old friends are tested by their dealings with the next generation. Heck Longtree (Ron Starr) plays the young hotshot, brought along by Gil for the gold but easily distracted by a pretty face. Elsa Knudsen (Mariette Hartley), a sheltered farmgirl, joins the group to elope with her fiance, Billy Hammond (James Drury), a miner. It is at the mining camp that the quality of the film changes from an old-fashioned Western conflict between "real men" to the portrait of an amoral world: they are welcomed by the raucous laughter of the local madame. Billy Hammond is not a bashful sweetheart but only the most mannerly of a crude band of brothers who believe in share and share alike--whether it be gold or brides. In his first film with Peckinpah, Warren Oates appears as Henry Hammond, the most menacing of the brothers, while another Peckinpah regular L.Q. Jones appears as Sylvus Hammond. The wedding sequence most foreshadows later Peckinpah work, with its bacchanal atmosphere that easily erupts into violence. The sheltered Elsa hopefully dons her sainted mother's wedding dress--only to find herself being married in the brothel, with prostitutes as her bridesmaids, and a drunk judge officiating. Elsa's yearning and dreams are strangely reflected in the words of the Judge (Edgar Buchanan, known to most as Petticoat Junction’s Uncle Joe) as he momentarily rouses himself and gives strangely affecting speech about the miracle of a true marriage. The irony of this speech, delivered in such a place to a woman marrying in such a family, perfectly sets the tension for the depravity that follows. This film alternates between the themes of films such as The Man who Shot Liberty Valance and High Noon (demonstrating the minor rewards of a heroic life) and the themes of Peckinpah’s later work (depicting the amoral societies where heroism has no place). Though the film eventually affirms the legacy of Steve Judd, the corruption personified by the Hammonds foreshadows a less than perfect future.